Emory University Hospital was named the top hospital in metro Atlanta and in Georgia. U.S. News & World Report has named Emory University Hospital the top hospital in both metro Atlanta and in Georgia in its 2012 guide to "America's Best Hospitals." Emory University Hospital includes Emory University Orthopaedics & Spine Hospital. Other highly ranked Emory hospitals include Wesley Woods Geriatric Hospital of Emory (2nd in Atlanta, 3rd in Georgia); Emory University Hospital Midtown (4th in Atlanta, 5th in Georgia), and Saint Joseph's Hospital (7th in Atlanta, 12th in Georgia). Nine top hospitals were named out of all 60 hospitals in metro Atlanta, including Marietta and Sandy Springs. This is the 23rd year in which U.S. News has highlighted hospitals by number of nationally ranked specialties and high-performing specialties. This year's evaluation included 5,000 hospitals nationally, of which 152 were selected for inclusion in the list of top hospitals. 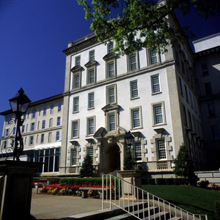 Emory University Hospital is nationally ranked in five specialties: cancer, cardiology and heart surgery, geriatrics, neurology and neurosurgery, and psychiatry. It also is ranked high performing in nine specialties: diabetes and endocrinology, ear, nose and throat, gastroenterology, gynecology, nephrology, ophthalmology, orthopaedics, pulmonology, and urology. Wesley Woods Geriatric Hospital is nationally ranked in geriatrics. Emory University Hospital Midtown is high-performing in the following specialties: cancer, cardiology and heart surgery, diabetes and endocrinology, ear, nose and throat, gastroenterology, geriatrics, gynecology, nephrology, neurology and neurosurgery, orthopedics, pulmonology and urology. St. Joseph's Hospital is high-performing in gastroenterology and geriatrics.